Sonic Reign might have come to some attention when their 2006 debut Raw Dark Pure was given a re-issue through Metal Blade Records, awarding the Germans a slightly higher profile than the lion's share of underground European black metal. I have to admit, I don't recall so much after a cursory listen through that album, and the band's handle is hardly one to capitalize upon the aesthetics generally associated with the genre; that LP has since totally evaded my radar. However, Monument in Black, their sophomore outing through Apostasy Records, is very unlikely to suffer the same fate. A colossus of catchy, curving riffs with huge production values, it's about as professional and ambitious as you're going to hear when it comes to that small subset of bands clinging to the fundamental ideas of the genre, yet not shying away from the benefits of a booming studio sound and application of textures and atmosphere to even the most basic riffing progressions. 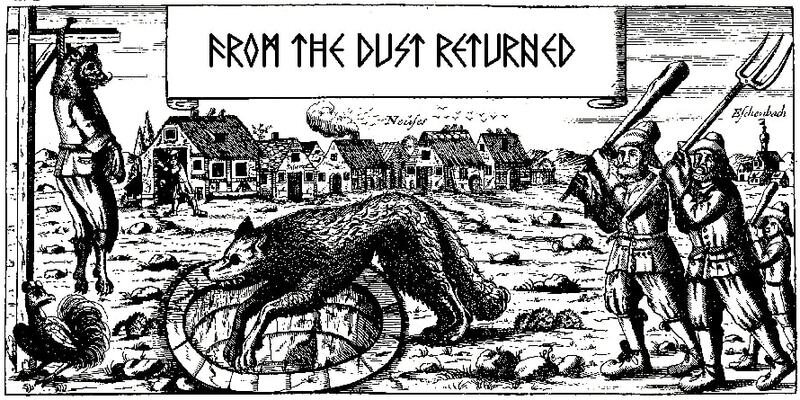 There is definitely an enormous amount of that 'black & roll' vibe I'm picking up here, primarily redolent of the style Satyricon have been exploring on their latest albums Diabolic, Now or The Age of Nero. To some this might posit an immediate red flag, but I've no opposition whatsoever to a band focusing in on a few good, pervasive, dark riffs and then rocking my headstone off. Another comparison could be to Denmark's Horned Almighty, but where they manifest that Hellhammer swagger into some more abusive and street ready, Sonic Reign have a more complex, stately approach to the similar, massive riffing sequences. The rhythm tone is bold and punchy, perfect for the more brazen, black/punk riffs, yet punctilious towards the more clinical intricacies of the various blackened thrash spurts. The leads are almost uniformly excellent, reminding me in places of Raise Hell's Not Dead Yet with its eerie, simplistic approach to the solo; but what really sets Monument in Black apart from related works is how beyond this, they manage to create this broad, wave-like sense of depth and atmosphere as backup to the Scandinavian-styled notation. Another key is the level of variation here. While the vocals have a bite akin to Satyr, and don't change up all that much through the 47 minutes, the riffs cast wider nets, from violent thrashing eruptions like the bridges of "Abhorrence Vs Scum" and "Daily Nightmare Injected" to the straight, catchy rocking abyss of something like the opening volley of "The Whispered in the Dark". 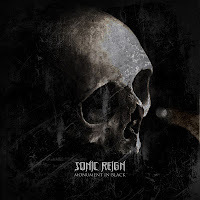 Sonic Reign pace themselves extremely well, and ultimately the album has memorable moments scattered through all seven compositions. Granted, there are a lot of familiar sounding sequences, and the vocals, drums and bass don't really stand a candle to the guitars, but it's painstakingly evident that these guys care a great deal about songwriting and tempo balance. So if you're just seeking out another blast-heavy, generic, black metal act with endless tremolo picking melodies and nothing dynamic or distinct whatsoever, Monument in Black is not going to be your thing; but if you enjoyed The Age of Nero, or most of Khold's discography, then this should hold some appeal. Not an entirely amazing album, but the chops and production are excellent (for just two guys), and it honestly leaves their debut behind, inhaling its hellish exhaust.